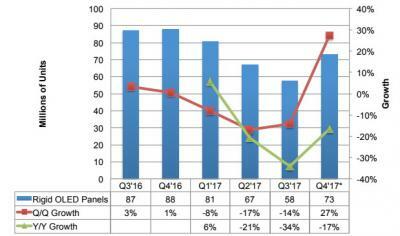 DSCC estimates that 88 Million smartphone OLED displays were shipped in Q3 2017, which represents a 4% drop from Q2 2017 and a 13% drop from Q3 2016 - mostly due to delays in iPhone X shipments. 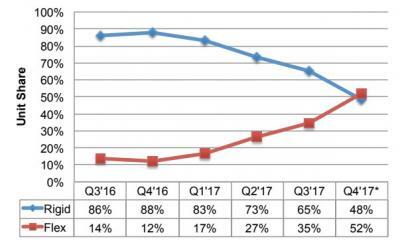 Flexible OLED shipments were up 25% from Q2 2017 (30.4 million units). Shipments are expected to grow significantly in Q4 2017, though, to reach 151 million units. 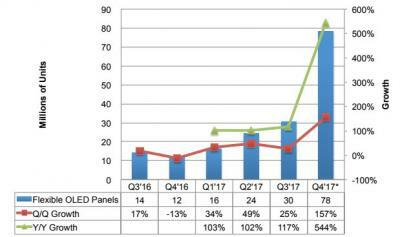 Flexible OLEDs shipments (78.3 million) will grow 157% from last quarter and 544% from last year, and will surpass rigid OLED shipments (73.3 million) for the first time. Looking at the entire 2017, DSCC sees a modest growth of 12% to 428 million units, doe to the Apple delay and the fact that Samsung is still the only meaningful supplier (Samsung is expected to have a market share of 98% in the smartphone AMOLED market). Samsung is followed by LG Display (3 million units in 2017) and then EverDisplay, TianMa and BOE. BOE recently announced that it started to produce flexible OLEDs, but DSCC estimates that real volumes will actually begin only in April 2018.